New Wave is the ninth studio album by American heavy metal band Powerman 5000. The work is scheduled for release on 27 October 2017 through Pavement Entertainment. The ensemble has scheduled a world tour from late 2017 until the end of 2018. 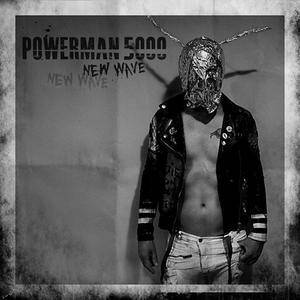 New Wave" is POWERMAN 5000's eleventh official release since forming in 1992 and continues the strides and success, from their platinum-selling album "Tonight The Stars Revolt!" to their most recent chart-topping single in 2014, "How To Be A Human". POWERMAN 5000 vocalist Spider One stated about "Sid Vicious In A Dress": "I suppose at its simplest it's a twisted love song, but really it's about loving what hurts you, what is bad for you. Staying when you should run. Over the years, Sid Vicious has become the poster child for chaos and self-destruction. I just took that and put it in the form of a beautiful girl. The title of the song kind of says it all." Regarding the overall sound of the follow-up to 2014's "Builders Of The Future", Spider One said: "We went a bit dirtier on this one. Ripped it up more than the last couple of records. One of the goals was to recreate the noise of the live show. Keep in the chaos." On the topic of the new album title, Spider said: "New Wave? Are we a new wave band? Well, I would say that we have always had more in common with DEVO than DIO." POWERMAN 5000's legacy continues to push the boundaries of rock, metal, industrial, rap and punk to create innovative and groundbreaking releases time and time again. With songs like "David F**king Bowie", "Cult Leader" and "Sid Vicious In A Dress", the new album is sure to please longtime fans, as well as turn the heads of many more to come.